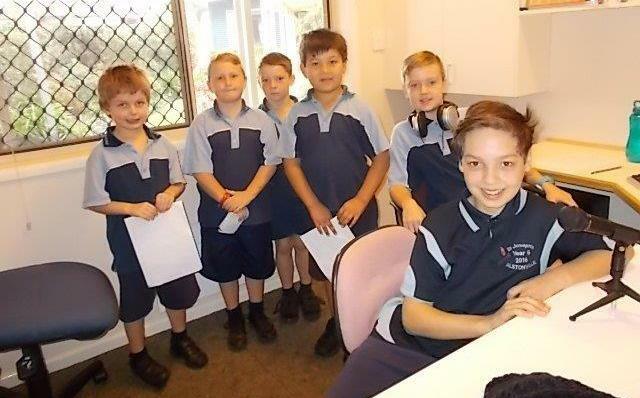 88.3FM Radio Maranoa has welcomed new talent to its team, with primary students from St Joseph’s Catholic School delivering the news, weather, jokes and live music across BaptistCare Maranoa Centre’s in-house radio station in Alstonville. The radio studio was established a couple of years ago for residents and pupils from St Joseph’s Catholic School were already regular visitors to the facility. When one teacher saw the studio, she suggested getting the children involved. Now, each Wednesday, the school’s radio club present their program to residents – and their classmates as the narrowcast signal is strong enough to stretch to their school next door. Libby Spash, the teacher leading the radio club says the children research for the program themselves the day before and choose the music from residents’ donated CDs. “They decide on a theme and build a program around that theme,” she explains. Regular Radio Maranoa newsreader, 11-year-old Daniel Pereira says he looks in newspapers and websites to find what he will be reporting about. “I report on everything – I did the magnitude quake in Italy and the local news,” he says. Mr Pereira says it’s a great opportunity and he’s keen to take his experience further. “I’d like to do some work experience at a radio station and work in radio,” he says. Tom Rowling, 10, has participated on several occasions reporting on international, national and local sports and events. He reported on the swimming in the Olympics as well as more recently NLR, AFL and local sports events. “We do the whole news script in the classroom,” he says. “It’s quite a lot of work.” While he thinks this is a great opportunity and he enjoys doing the broadcasting, Mr Rowling would prefer to follow a career in engineering. Interviewer and head of call-outs and shout-outs, 9-year-old Angus Smyth says it’s a lot of fun and he’s encouraging people to be involved. “Some people are a bit shy but you only hear your voice on radio,” he points out. Mr Smyth has interviewed students, teachers, parents and residents for the radio program; just recently he interviewed one resident who spoke about his time in the marines. While he would consider a career in radio, Mr Smyth is also thinking of studying to be a paediatric dentist. BaptistCare Maranoa Centre, Residential Manager, Greg Price says it has been great to see the level of involvement increase over the last few months, with the broadcasts progressing from once a fortnight with four students to 12 students on a weekly basis. “Alstonville is a local community where there are many family connections with the residents. However, the radio program has opened up more interest in community engagement from both the students and their teachers, and the parents of the students involved,” Mr Price adds. BaptistCare Maranoa Centre residents have relished the enthusiasm and talent the school radio club delivers. The school’s principal, Therese Seymour, views it as more than just a service to their elderly neighbours. “This is an exciting opportunity to build the skills of students outside the everyday curriculum areas,” she says.